Whilst the lizards here are a source of fascination, the spiders are another story. We appear to be in spider season, (if there is such a thing?) and at the moment every corner I turn there's a huge golden orb in my track. They take great pleasure in spinning their webs just a fraction above eye level across your walkway, and I swear they do it overnight! These things are huge! 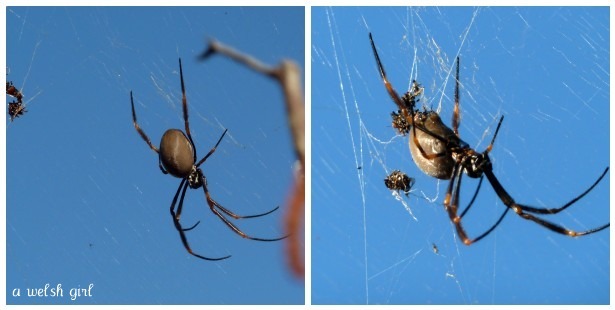 I'm not kidding when I tell you that you can bounce back from a golden orb web! 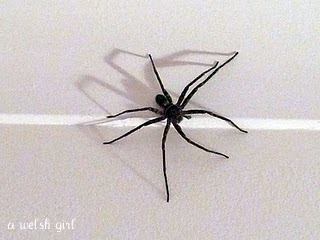 Thankfully they are pretty harmless as far as Australian spiders go. On our walk to school recently we counted 44 golden orb spiders...and that was just in three trees. 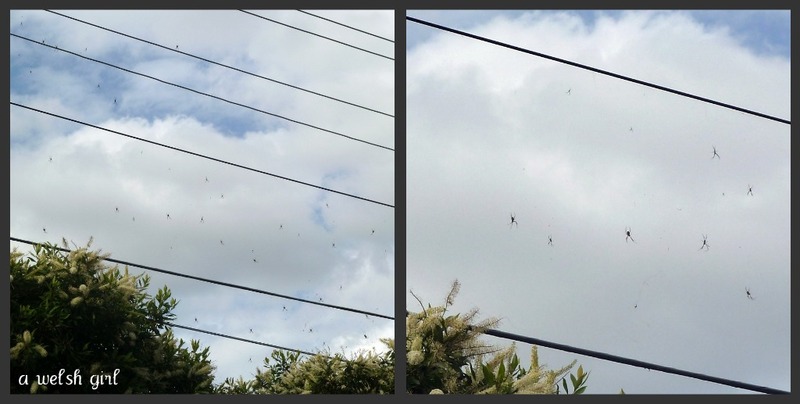 They were in an enormous web suspended between the trees and an overhead power line...a little village of spiders. No spider post would be complete without a quick mention of the ever present huntsman. He's been a little quiet lately, but husband reported a sighting in the study last week. 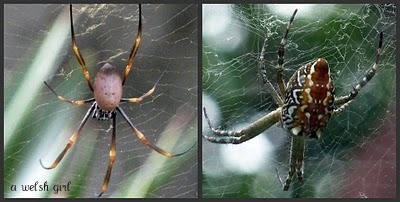 If golden orb spiders are huge, these things are monsters...! We are talking the size of an adult hand here! We have a hunstman lodger, he's so big he almost needs his own bedroom! You can read more here, here and here. Fortunately we have avoided any encounter with dangerous and venomous spiders. However many stories you will read or hear, coming face to face with one is pretty rare - you just have be vigilant. We check closed in shoes that have been left outside or not been worn for a while and keep a lookout when in the garden or on a walk. Sibs and I once spotted a couple of redbacks hiding in a metal road barrier. 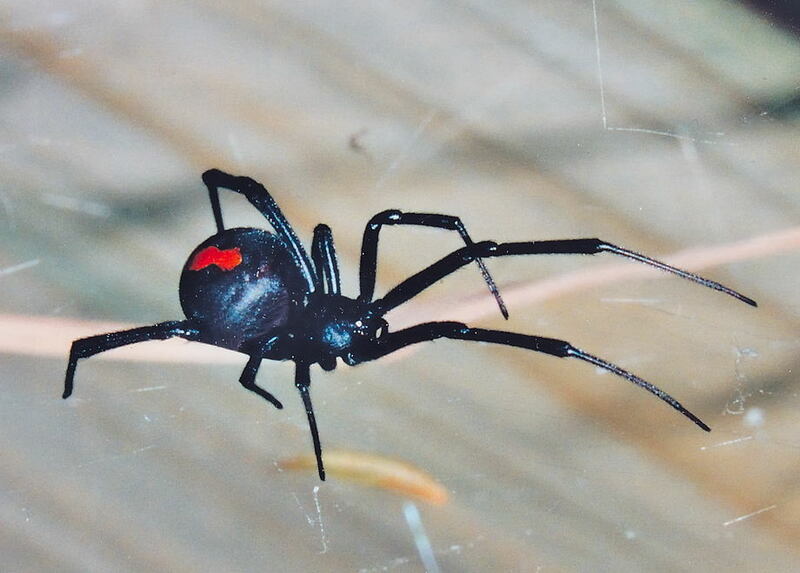 Once seen, you will never mistake a redback for another spider. They were actually smaller than I expected, but very distinctive, an we gave them a wide berth! ﻿ but please don't let this spider talk put anyone off from visiting....if I can live here... ! Is there anything else you'd like to know more about? Something less squeamish? My goodness, that's a lot of spiders! We don't have those in Tassie (thankfully) and our huntsmans are chunkier. They totally freak me out, more than any other critter! I scratched myself 16 times and looked over my shoulder twice whilst reading that...not that I'm scared of spiders or anything! I am not a spider person but I do love taking pictures of them too. There are so many around at the moment at our place too!